If Breakfast at Tiffany's and the United Nations had a love-child, Pink Martini would be its name. This "little orchestra," which draws inspiration from music all over the world and crosses genres of classical, jazz and old-fashioned pop, has provided a "great way to mix politics with entertainment -- at this point, the same thing in America," says co-founder Thomas Lauderdale. Since 1994 the band has sold well over 2.5 million albums worldwide, has regularly appeared on NPR and has played with over 50 orchestras across the globe. This weekend Pink Martini returns to the legendary Carnegie Hall for two concerts with the New York Pops and its openly gay music director/conductor Steven Reineke. The multi-denominational holiday show features favorites from the band's bestselling album Joy to the World. Lauderdale recently chatted with me about his life, his musical projects and the upcoming Carnegie Hall appearances, which he calls "the most important performances the band will ever give." Stroud:	Someone told me that before you came out to your family, your father had already beaten you to the punch. Lauderdale:	My father came out when I was 10. It took me another eight years to be able to comfortably say that I was gay. When I was 13, my parents always constantly joked about me bringing home guys. I was just too embarrassed. Stroud:	Hadn't your parents gone on talk shows about what happens when a spouse comes out of the closet? Lauderdale: They went on 20/20, Cristina and Oprah -- nobody really wanted to hear their happy, well-adjusted story. Stroud:	Your father was a pastor, left the church when he came out and then became a pastor again? Lauderdale:	He's the first openly gay minster in my father's denomination, which is Church of the Brethren, historically a socially progressive anti-war denomination. My mother was a hero in the sense that she didn't flip out when my father finally fully came out. They'd actually talked about it before they were married in 1962 in Lafayette, Ind. They met at Purdue, and they talked about it, but everyone -- doctors, psychologists, clergy -- everyone said, "Get married. It will go away." So they earnestly went forth and adopted four children. Then, when I was 10, my father finally came out. We say that he ran off with a German guy, which is 80-percent true. He didn't really run off with the guy, but he did have an affair with a very attractive German man who worked on our plant nursery. Stroud:	It's like a soap opera, but with really kind characters. Lauderdale:	I remember the day my parents finalized their divorce. They took the entire family to see 9 to 5, the Dolly Pardon/Lily Tomlin/Jane Fonda vehicle. Lauderdale:	I see the camp factor, but my parents are really from the earnest side of the '60s. They were socially progressive, but they weren't hippies. When my mother remarried, my father actually performed the service. Lauderdale:	They're all retiring together in the same retirement home. It's nutty. Lauderdale:	It's a well-adjusted story. Growing in that atmosphere, it would have been very easy for me to come out much sooner, but I felt so nervous about myself. I thought at the time that I would never be able to become mayor of Portland and be gay. That is now absurd. Growing up gay, it's tough simply because it's very rare that any person feels entirely confident about him- or herself. We all struggle with the question, "Am I ever going to find love?" In that sense, everybody's in the same boat. We just need to be a bit gentle with ourselves and also empathetic with everybody else. Stroud:	So the process is extraordinarily difficult, even if you have a parent who's out? Lauderdale:	Yeah. It's the question of, "Am I attractive? Is somebody going to love me?" I have a sense that we all -- no matter how fantastic or terrible our biographies are -- we each have this different little struggle. Stroud:	How did you two meet? Lauderdale:	We met at a crêperie owned by John Brodie, who was the first manager of the band, in Portland, Ore., eight years ago; it was actually the night John and I played at a political rally with Howard Dean. Then I was hungry for crêpes afterwards. One thing led to another, and I discovered Philip, who is 12 years younger than me. He had never heard a record, let alone a 78, so I lured him into my building with a promise of hearing Yma Sumac on a record player for the first time. Lauderdale:	And he never left. Stroud:	Any plans for marriage? Lauderdale:	We registered as domestic partners last year. Marriage -- it's not my most pressing issue. I'm much more interested in education, poverty, intergenerational activities. Gay marriage is fine, but sometimes in the lesbian and gay [community], at least historically, one of the problems is we've been so concerned about our own personal needs, as opposed to how we can be advocates in other struggles which I think are parallel -- and just as important. The only thing that separates a lot of gay guys from being Republican assholes is the fact that they're gay. Stroud:	Earlier today I heard the audio track you made of iconic comedian Phyllis Diller, who died this year. How did you two meet? Lauderdale:	Kim Hastreiter, who's the editor, publisher and co-owner of Paper Magazine in New York, started playing triangle with us several years ago and now does cymbals. I bought her a glockenspiel last year and she's kind of... Do you know her? Lauderdale:	She's amazing. She, with her friend Joey Arias, drove across the country from California to New York in the mid-'70s and started Paper Magazine with David Hershkovits. Anyway, she knows everybody. So when we played at Disney Hall on New Year's Eve last year, I begged Kim to take me over to Phyllis Diller's house, which she did. Phyllis Diller made us chili. The other sort of amazing thing about Phyllis Diller is that in recent years she'd become a painter. So there were hundreds of paintings on the walls with price tags on each of them. You would just take the paintings off the wall. You'd be tallied up at the end of the night, write a check and off you would go. I had to buy a new suitcase to go back to Portland the following day. I knew that Phyllis Diller had been a fantastic pianist and that she had it within her to actually record a song. So I asked if she would consider recording "Smile," the Charlie Chaplin song. Amazingly, she agreed. She knew precisely how she wanted to sing it, and there was very little direction from me. It turned out to be her last recording. I really love how it came out. It's very beautiful, very respectful -- and very much her. Stroud:	Will the song be part of your upcoming release, Get Happy, coming out in the spring? Lauderdale:	Ostensibly, yes. It will definitely be on the next album. Whether it's called Get Happy remains to be seen, because, so far, I'm worried that the material isn't happy enough. Stroud:	It could be an ironic title. Lauderdale:	But I don't want the band to really be ironic. I feel what's required right now is an uplifting, hopeful, happy album. I'm just having a tough time finding that right now because it's a little dark. Stroud:	Because you're dark, or because you think it's a dark time? Lauderdale:	I'm dark, but also culturally right now at this moment in American history, we're in a kind of a weird limbo-land. We really dodged a bullet in the last election, but the country as a whole, we're not getting any smarter. In fact, a lot of people seem to be getting dumber, and the discussion has become dumber. That worries me. So I'm trying to find as much optimism as I can. Some days that's more difficult than others. One of the most amazing things and exciting aspects of my life right now is that I have been working on this Myrlie Evers-Williams project. She's the widow of Medgar Evers, who was assassinated in 1963 in Jackson, Miss. He was that state's first NAACP field director. I heard her speak at a luncheon a couple years ago. In the introduction, Dan Wieden [co-founder of ad agency Wieden+Kennedy] said that she had studied to be a classical pianist with dreams of playing Carnegie. I thought to myself, if ever we get a chance to play Carnegie again, I would ask her. So it's been an ongoing campaign for about a year in terms of convincing her to actually do this. I'm happy to say that at age 79, 60 years after she put the dream aside to work for civil rights in America, she's going to make her Carnegie Hall debut. Lauderdale:	White people, when they think of civil rights in America, think of Martin Luther King. Maybe a few of them think of Malcolm X, but Medgar Evers was really right in there. He was the first of the major assassinations of the 1960s in America. Myrlie appeared on the cover of Life magazine at his funeral, comforting her son. The death prompted President Kennedy to ask Congress for a comprehensive civil rights bill, which President Johnson signed the following year. Stroud:	How hard was it to get her to agree to join the band onstage? Lauderdale:	It was difficult. I started talking... Actually, the day that I had my first conversation with her, I was in Los Angeles recording with Phyllis Diller. Later that day I had my first, very long 45-minute conversation with Myrlie Evers-Williams, who had just moved to the Alcorn State University campus in Mississippi. It's where she met Medgar in 1950. She said first, "You're crazy!" and then she said, "Nobody knows that I'm crazy," which I thought was a good line. I could tell there was at least part of her that was open to the concept. So I went on this huge lobbying campaign. We had six conversations and finally met up in June, when she agreed to do it. Suddenly her health took a nosedive. Her doctors grounded her, and it looked pretty bleak. She had to cancel an appointment she had with President Obama one-on-one. So I gave up on the idea. Then two months ago, her daughter called and said she was doing better. Two days after the election I flew to Mississippi, drove to Alcorn, met her, and it's just been an amazing adventure from that point to now. It's the first time she's lived in that state since 1964. So much has changed in Mississippi. The airport is actually named the Medgar Evers Airport in Jackson. Just the 24 hours that I spent with her and her daughter Rena was overwhelming, because everybody flocked to them. It was as if the Kennedys had left Massachusetts for 50 years and suddenly were back. Stroud:	So this will be the first time that she has performed with Pink Martini? Lauderdale:	It's the first time she's performed, really. Lauderdale:	After the assassination in '63, she took her three children to California, worked at ARCO in corporate affairs for 12 years and was appointed by Tom Bradley, the mayor of L.A., to the public works department. She was eventually elected the chairwoman of the NAACP. So she's really known as a speaker, author, civil rights activist, and very few people know that she ever studied to be a classical pianist. To be able to use the band as a vehicle for this larger thing -- which is about civil rights and race relations in America and the arts -- I couldn't be happier. I'm not sure how the band will sound. I can't adjust to it musically, just psychologically and harmonically, but I feel like they'll be the most important performances the band will ever give. 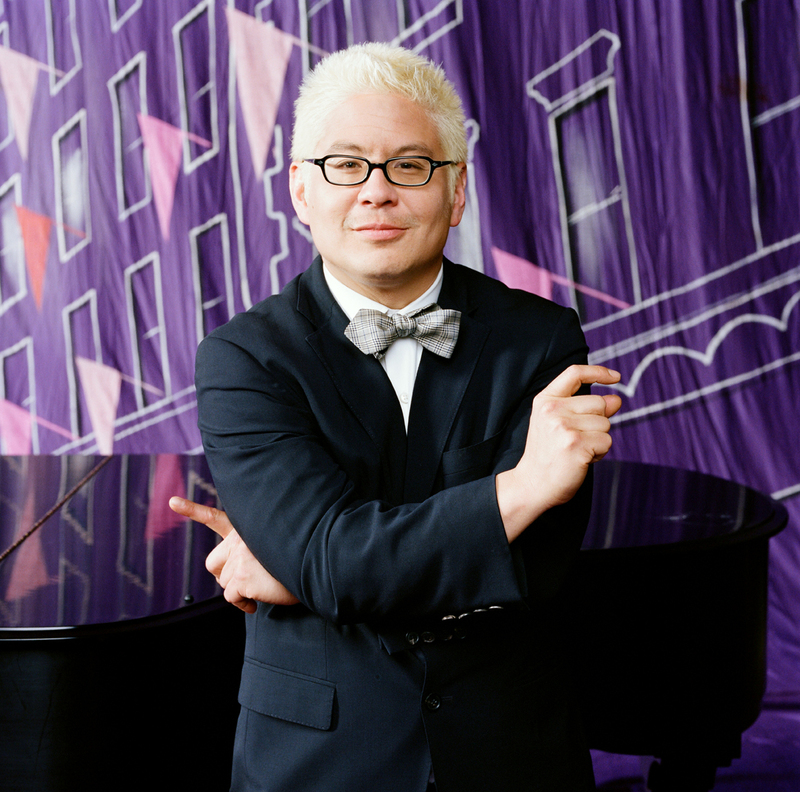 "Pink Martini: Joy to the World"
Friday, Dec. 14, and Saturday, Dec. 15, 2012, at 8 p.m. The New York Pops' 30th season continues with a tribute to Sammy Cahn on March 8, 2013, and a celebration of Stephen Schwartz, composer of Wicked, on April 13, 2013. The season culminates with the orchestra's 30th Birthday Gala on April 29, 2013. For more information, visit www.carnegiehall.org.